The Kawai CA98 Digital Piano builds on the power of the CA78 and adds a huge 3-speaker, 135-watt speaker system making it ideal for larger rooms or venues. Complete with a powerful dual sound engine, Bluetooth connectivity, Onkyo enhanced audio system and much more, the CA98 shines. Imagine sitting at the business end of a full-size flagship Shigeru Kawai grand piano and having the sound it creates in your living room. Well, now you can thanks to the CA98's powerful SK-EX rendering sound technology. 88-key sampling and resonance modelling technology painstakingly recreate the sound of the Shigeru Kawai. The result, a blend of Piano's that you can perform and practice with, anytime. A quick switch to "sound mode" also gives you 88 other sounds from organs to strings, synth and much more all powered by the Harmonic Imaging XL engine for excellent instrument recreation. In order to articulate the superb SK-EX and HI-XL sound engines, the CA98 boasts Kawai's top of the range Grand Feel II wooden-key action with Ebony and Ivory Touch key surfaces, counterweights, and ‘Let-Off’ mechanism. Every nuance of your playing will be faithfully translated to deliver a performance that feels natural and sounds astonishingly rich. 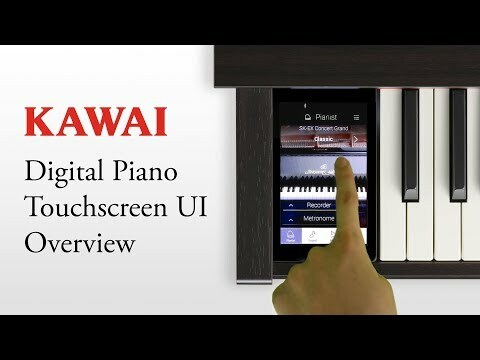 The Kawai CA98 Digital Piano has the ability to connect to iOS or Android smart devices and can be used alongside many apps to improve learning and add richness to your performances. Moreover on the evenings when you wish to sit back and relax, connect your device and playback some music through the impressive Onkyo-enhanced built in audio system. The Kawai CA98 Digital Piano may look elegant but inside it contains some incredible technology. A virtual piano technician can be accessed to change 19 parameters of the piano sound to your exact liking. A sequencer captures data and there's an audio recording mode via optional USB so that you can treasure your performances forever. Finally, should you wish to use it with your digital audio workstation you can do so via traditional MIDI or USB MIDI. The Kawai CA98 Digital Piano is a serious performance machine that will provide many years of skill progression and playing satisfaction. Next-generation technology wrapped in an elegant cabinet, this is a seriously impressive instrument.